Ugh. I have a fever of 102.1°F. But I'm a blogger, dammit. You depend on me to entertain you, and I'm not going to let you down. So let's do this. 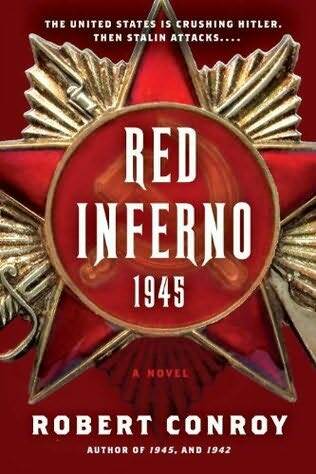 Today, I offer a review of Red Inferno: 1945 by Robert Conroy. It's an alternate history novel in which war breaks out between the US/UK and the USSR in the closing days of World War II in Europe. Unfortunately, there isn't enough published alternate history to keep up with my appetite, so I've had to read mediocre authors rather than deprive myself of my favorite genre of fiction. His first novel, 1901, about a surprise German invasion of New York City, was historically preposterous. 1862, about the British entry into the American Civil War, and 1945, about the US ground invasion of Japan, were somewhat improved. But in all of these novels, major characters acted and thought like socially conscious 21st Century Americans, and lapsed into sanctimonious moralizing about the evils of American racism. 1945 is largely free of these problems. He takes a few swipes at racism, homophobia, and McCarthyism, but the novel features few preening lectures about social inequalities in American society. The characters act like real people. Realism is the most essential quality in alternate history, and Robert Conroy has greatly improved. 1945 makes sense, both in historical variation and individual behavior. It's exciting and worth reading. Umm, check the author name and title of your post. I think you made a voice of Batman slip. Fixed now, thanks. I suspect that I was thinking of Batman.